Illuminated Manuscript, Gospels, Walters Art Museum Ms. W.592, fol. 2b, originally uploaded by Walters Art Museum Illuminated Manuscripts. 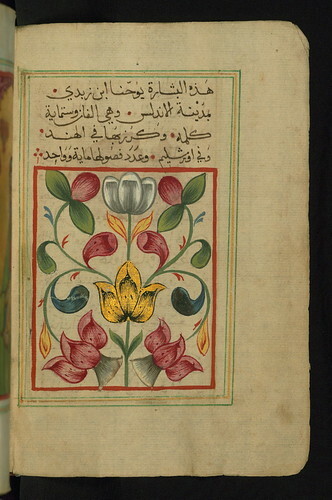 This illuminated and illustrated Arabic manuscript of the Gospels by Matthew (Mattá), Mark (Marquṣ), Luke (Lūqā), and John (Yūḥannā) was copied in Egypt by Ilyās Bāsim Khūrī Bazzī Rāhib, who was most likely a Coptic monk, in Anno Mundi 7192 / 1684 CE. The text is written in naskh in black ink with rubrics in red. Painted floral composition ending the preface to the Gospel of Matthew.